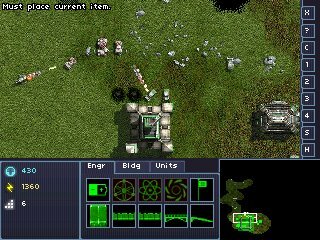 While DirectX was not available to game developers for the Pocket PC platform, Microsoft created a game API especially for the Pocket PC named "GAPI" -- the game application programming interface. It allows direct and fast access to the display memory. With this package many PocketPC applications like games, media players, GPS navigators and emulators are now also usable on Windows CE devices. Some PocketPC applications needs additionally the AYGSHELL.DLL. You can find this in several PocketPC- fake- DLL packages. You find a complete list of the supported HPC- devices at the bottom of this page. 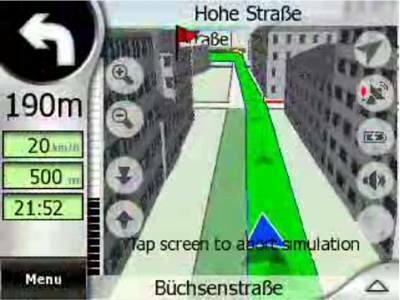 Screenshot GPS navigation application MioMap / iGO on a Windows CE .NET 4.2 device. These settings depends on the used display orientation of your device and may differ from this example. Please don’t forget to delete the old and incompatible GX.DLL from the iGO- or MioMap- directory. It contains a shell, skins, unlock scripts, some programs and some PocketPC DLLs that are missing on Windows CE 4.2 and CE 5.0 devices. Incl. GAPI for HPC’s. 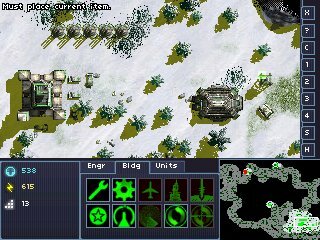 This game, designed for 240x320 portrait- PocketPC displays, can be used with the GAPI rotate- option also on 320x240- landscape displays. 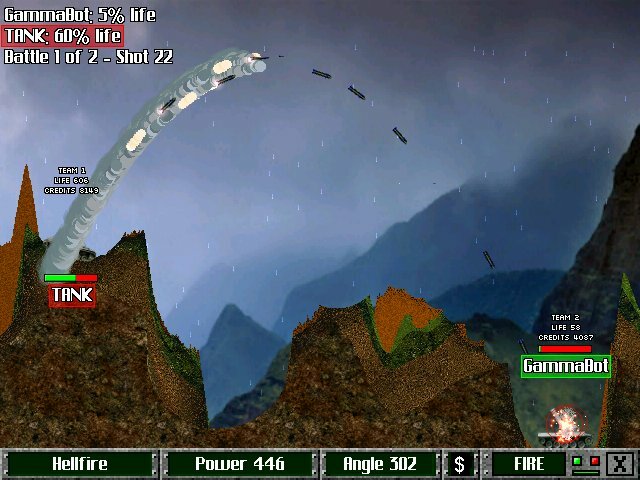 Screenshot PPC game “Warfare Incorporated” from HP Jornada 720 in 640x240- fullscreen- mode. Screenshot “The Core Pocket Media Player (TCPMP, aka BetaPlayer)” from a HP Jornada 720. With GAPI you get a 30-50% higher framerate compared to GDI. 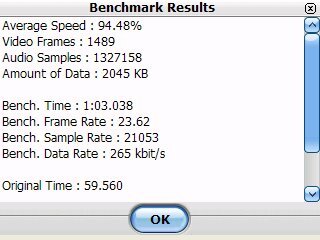 Screenshot: Benchmark results CorePlayer (left with using the GDI-, right with using the GAPI- driver). Speed improvement: 146% (tested with a 640x240, 25fps divx- video in fullscreen). Please activate the ”Framebuffer Cache”- option in the GAPI setup menu. Screenshot multi- platform emulator “Morphgear” from a HP Jornada 720. With GAPI the emulation speed increases up to 100%. Screenshot Commodore Amiga emulator PocketUAE from a Psion Netbook Pro 800x600- display. Most of them requires a working GAPI- GX.DLL. MilkyTracker is a open source music editor and player for MOD- and XM- modules similar the good old Soundtracker and Fasttracker editors. The graphical user interface uses GAPI to improve the speed of the scopes and scroll- lists. If you have a PocketPC, you can use Microsofts version of the GAPI- DLL which is already included on your device (File: Windows\GX.DLL). Until your device is supported, you can use the included GAPI- emulator instead. 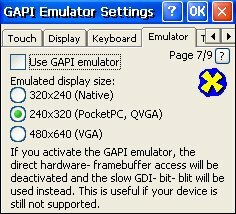 The emulator- mode uses GDI- BitBlits instead of the direct hardware access and may be much slower. GAPI is like a device driver and must be adapted to the display controller hardware of a new device. In the past (until v4.01) we have done this for free, but in the meantime there exist so many new devices that the effort is very high. Therefore we have decided to create new adaptions for a small fee of EUR 19 payable via PayPal. Please send your GAPI adaption request to to get more informations. This non commercial adaption will be done within 1-2 days. Please contact us also if you need a adaption for commercial purposes. 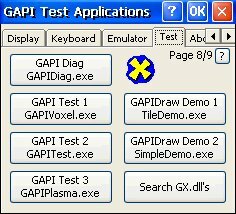 The GAPI package contains the tool GAPISetup.exe which allows the configuration of the GX.DLL. 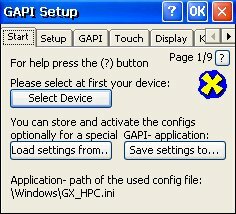 All GAPI- settings are stored into the registry and into the ini- file "GX_HPC.ini" in the Windows directory of your device. The GAPI (GX.DLL) reads the settings at first from the GX_HPC.ini and then, if not available, from the registry. To configure a GAPI application individually, you can copy the ini- file with the special settings into the directory of your desired GAPI- application. Here you can choose your device from the list of supported devices. "GAPI for HPC's" is a kind of display driver and has to be adapted to a new device manually. Until your device is supported you can use the included GAPI- emulator (see page 7) instead. The emulator uses GDI- BitBlits instead of the direct hardware access and may be much slower. Per default the settings are loaded from \Windows\GX_HPC.ini. If you have made a special configuration for a GAPI application you can load the settings from the GX_HPC.ini in the GAPI application directory. If you want to apply the current settings to a special GAPI application you can store the GAPI- configuration file "GX_HPC.ini" into the directory of your preferred GAPI application. This GAPI application uses the settings from this stored GX_HPC.ini instead of the "global" settings from the GX_HPC.ini in the Windows directory. With this function you can define application- individual GAPI settings (e.g. special keyboard mappings or different graphics orientations, etc.). The GAPI- settings will be always written to the chosen GX_HPC.ini, the \Windows\GX_HPX.ini and the registry. This will increase the framebuffer access speed on most devices. Should be disabled only if your device cashes. If your device has a display resolution > 240 pixels you can limit the accessable display width for the GAPI applications. This will hide the deskop and the icons behind a black layer. Could cause a crash on some devices. This will minimize the taskbar and increase the GAPI graphics- area. Some GAPI applications needs at least a visible display hieght of 320 lines. The Taskbar is still accessable. This will remove the Taskbar completely. With this you can change the orientation of the GAPI graphics area. 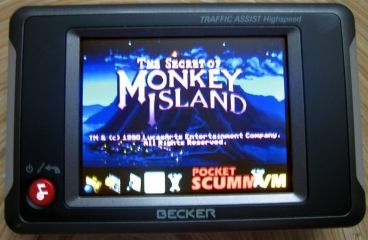 Useful if you have a 320x240- display and want to use a 240x320 PocketPC- application. 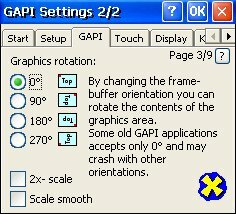 Some GAPI applications supports only a orientation of 0° and may crash with other settings. If you rotate the GAPI area you should also rotate the touch rotation. If you have a display with a higher resolution than 240x320 you can magnify the GAPI graphics area by factor two. 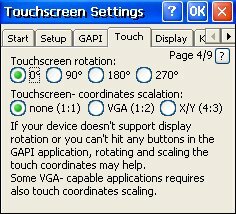 You should also change the touch coordinates- scalation to VGA (1:2). This eliminates the pixel block- effect. The activated smooth function may decrease the graphics speed a little bit. This function is not available in emulator mode. Should be used if you have rotated the GAPI graphics area. If you have a display > 240x320 and the 2x- zoom function activated you should also scale the touch coordinates. The touch coordinates are not altered. Required by some portrait applications used in landscape mode (e.g. Machines at War). Some devices supports the rotation of the display contents. This is a function of the display driver of your device not from GAPI. 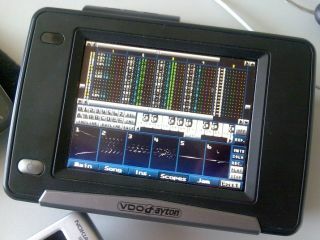 Useful if your devices has a 320x240 display and you want to use a 240x320 Pocket PC application. You should also change the touch- rotation to the same angle. GAPI tries to rotate the orientation after application start. Attention: This could confuse some applications. 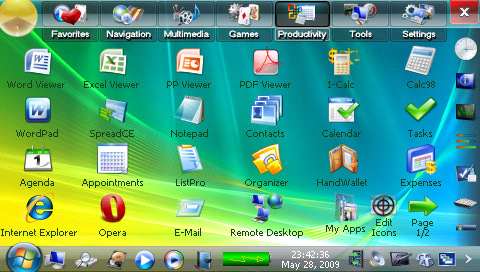 Most Pocket PC- applications can be controlled by the Pocket PC- application- buttons 1-6, the cursor keys and the "OK"- butto. 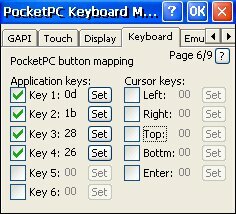 "Key 1" - "Key 6" are the six Pocket PC application- buttons (hot keys). Please prevent circular button mappings. E.g. If you try to map the cursor button "Left Arrow" to the Pocket PC button "Right Arrow" and vice versa you will get a error message because this will create a infinite mapping loop (left will cause a right button press, then right will cause a left button press etc.). 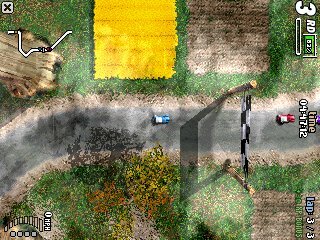 This could be a problem if you try to "rotate" the cursor buttons for playing portrait- PocketPC games on a device with a landscape display. If your device is still not supported by this package you can alternatively use the emulator mode. In this mode the application can't use the direct and fast framebuffer access. Instead the application writes the graphics data into a temporary buffer which is then blitted into the visible area of the display. This method uses the slow GDI- BlitBlit- functions. 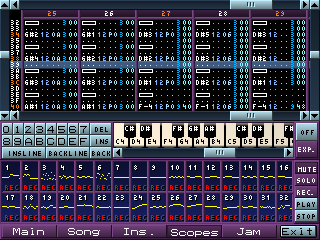 This mode is also useful if your device doesn't support the common 16bit- GAPI- RGB- color format. Here you can choose between the native resolution of your device, PocketPC standard (240x320, QVGA) and a VGA (480x640) PocketPC display. 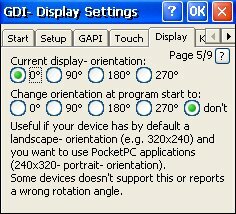 The PocketPC standard setting (240x320, QVGA) is the most compatible. Here you can find some test GAPI- applications to verify your settings. Lists the current GAPI parameters reported by GX.DLL like graphics area width, height, color bits per pixel and the x-y- pitch values. The pitch values specify the distance between pixel values in the buffer, because a framebuffer is not necessarily a 240x320 array of 16-bit values. It's up to the hardware maker how the video memory is organized. Some GAPI applications ignore these pitch values and use the default values XPitch=2, YPitch=480 instead and may crash if your device reports other values. If you have such a device/application combination you could try to rotate the GAPI area to a angle which uses the required X and Y- pitch values. A 3D Voxel landscape, rendered in realtime. A very fast plasma- graphics demo. GAPI parallax- scroller- demo application which uses the GAPIDraw- library from www.GAPIDraw.com. GAPI rotate- zoom- demo- application which uses the GAPIDraw- library from www.GAPIDraw.com. 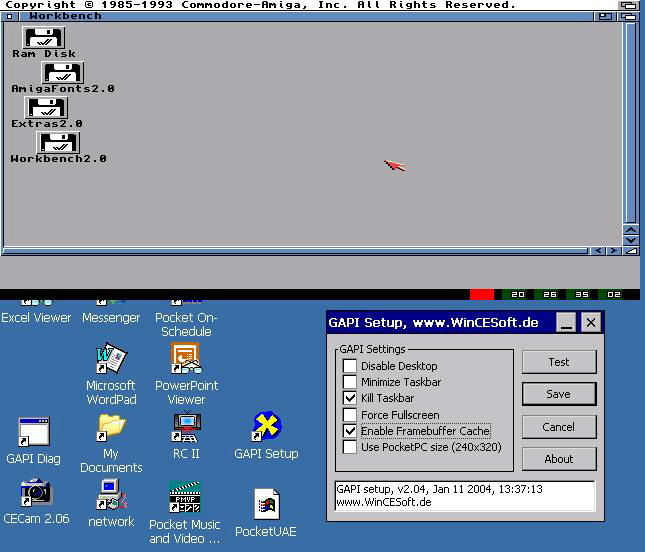 This function will search for incompatible PocketPC- GX.DLL's on your device. Please do this manually and delete these DLL's from the application directories. Small (100kbytes) installation package without GAPI test applications added. (TCPMP and Core player now works also on devices with 32/24bit color displays). 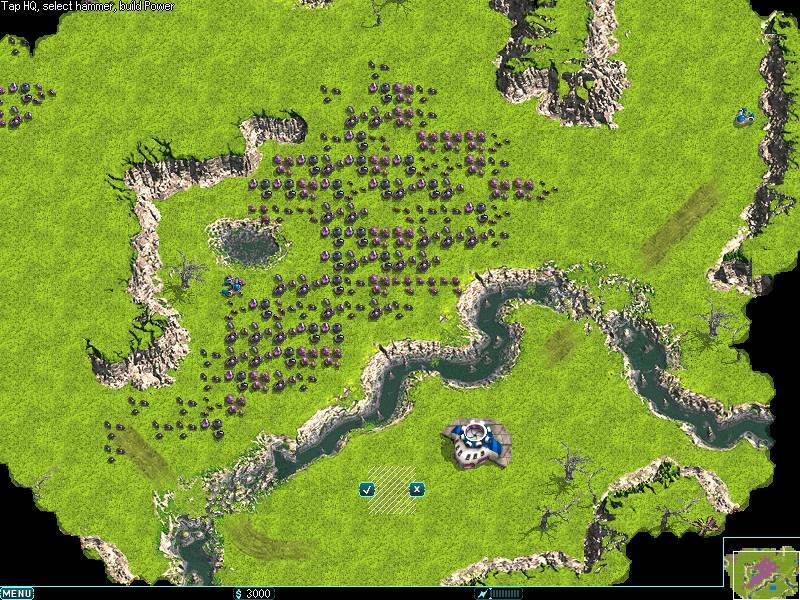 Touch- scale X/Y- problem for isotope 244 games fixed. New "fit to screen"- option for emulator mode. Nyditot entries from device list removed. GX_HPX.ini “save settings”- bug removed. Taskbar button of GAPISetup.exe is now visible. GAPISetup.exe bugfix: Keyboard mapping was activated by default. File size of GX.DLL reduced from 317kbytes to 195kbytes. Readme.txt added to the ZIP- archive with some install instructions. Now you can control PocketPC applications with the buttons of your device. GAPI- graphics and touchscreen- coordinates can be rotated independently from the desktop. With this you can use portrait- PocketPC- 240x320- applications also on devices with 320x240 landscape diaplays. Touch coordinates can be scaled. Useful if you want to use VGA- pocketPC- applications on devices with hi- res displays. If your device is still not supported you can use the included emulator instead. Copy the GX_HPC.ini from the Windows directory into the GAPI application directoy and the included GAPI- settings are used instead of the settings from the registry or GX_HPC.ini in the Windows directory. Bugfix: Hidden or minimized Taskbars are restored also after a GAPI application crash. This version saves the settings now also into a ini- file (GX_HPC.INI) in the same directory of the currently used GX.DLL. This is useful for devices which loses the RAM- and registry- contents after a power- off or suspend. If you put the complete installation package incl. the GX.DLL and the GX_HPC.INI into the same directory of the GAPI application (e.g. 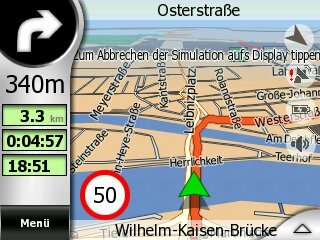 GPS navigation software) on the flashdisk, you don’t need to configure GAPI again after a resume or power- on. By default the GAPI settings are read from the registry. Are the GAPI registry settings not available, the settings are read from the GX_HPC.INI instead. 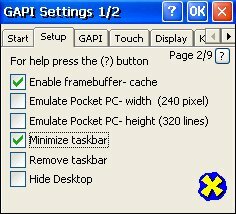 GAPI is now starting in non Pocket PC- mode (240x320) by default. Bugfix: Devices with the framebuffer origin at the bottom right side are now supported. Bugfix: Error message "Taskbar window not found! Can't hide taskbar." at program exit on devices without taskbar and deactivated "Hide Taskbar"- option. Samsung NEXiO XP40- 480x800 and 240x400 portrait modes added (untested). Support for Microsoft’s Windows CE 5.0 device emulator added. Bugfix: Warfare has reported “unable to find graphics mode for installed data”.